For another species called Chinese hawthorn, see Crataegus cuneata. Crataegus pinnatifida, also known as mountain hawthorn, Chinese haw, Chinese hawthorn or Chinese hawberry, refers to a small to medium-sized tree, as well as the fruit of the tree. The fruit is bright red, 1.5 in (38 mm) in diameter. 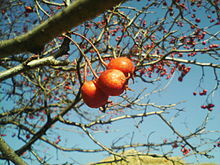 In Chinese, the fruit is called shānzhā (Chinese: 山楂, literally meaning "mountain hawthorn") or dà hóng guǒ (大红果, literally meaning "big red fruit"). In northern Chinese cuisine, ripe C. pinnatifida fruits are used in the desserts tanghulu and shanzhagao. It is also used to make the traditional candies haw flakes and haw rolls, as well as candied fruit slices, jam, jelly, and wine. It is also traditionally used as a finishing ingredient in Cantonese sweet and sour sauce, although it has since been partially supplanted by ketchup. In traditional Chinese medicine, the dried fruits of C. pinnatifida have been used as a digestive aid. ^ Phipps, J.B.; Robertson, K.R. ; Smith, P.G. ; Rohrer, J.R. (1990). "A checklist of the subfamily Maloideae (Rosaceae)". Canadian Journal of Botany. 68 (10): 2209–69. doi:10.1139/b90-288. ^ English Names for Korean Native Plants (PDF). Pocheon: Korea National Arboretum. 2015. p. 424. ISBN 978-89-97450-98-5. Archived from the original (PDF) on 25 May 2017. Retrieved 24 December 2016 – via Korea Forest Service. ^ Hummer, K.E. ; Janick, J. (2008). Folta, Kevin M.; Gardiner, Susan E. (eds.). Genetics and genomics of Rosaceae. New York: Springer. p. 11. ISBN 978-0-387-77490-9. ^ Flint, Harrison L. (1997). Landscape plants for eastern North America : exclusive of Florida and the immediate Gulf Coast. New York: Wiley. p. 158. ISBN 978-0-471-59919-7. ^ Chinese Cooking Demystified (26 November 2018). Old School Sweet and Sour Pork, without Ketchup (山楂咕噜肉). YouTube. Retrieved 2 February 2019. ^ Dharmananda S. (2004). "Hawthorn (Crataegus). Food and Medicine in China". January. Institute of Traditional Medicine Online.